Your wife and children want you to come home safe. Well, mostly the kids. But that’s not practical advice. In fact I believe it tends to desensitize people to the actual dangers as opposed to the real dangers. You really need to wait until the ice is thick enough to support the weight of whatever you are carrying. This includes your sled if the ice is thin. 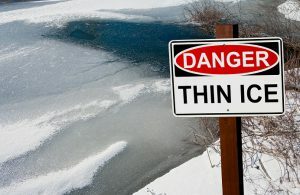 If the ice is thicker you might be out with an ATV or a snowmobile. Late in the wintertime you might be able to venture out with a full-size pick-up or an SUV. Personally, I use a full-size Ford F150 when I finally go out. Typically this means I need to wait until mid-January, but that’s no big deal because the prior month is filled with holidays, parties, birthdays and my anniversary. With a full size (yes – a 4 wheel drive Supercrew) pickup, that means I need at LEAST 12″ of ice. I prefer 15″-18″ before I really feel “safe”. When the ice is thinner than that, I typically walk out, pulling my “clam” ice fishing house. If there is snow on the ice…well…that makes it tougher to pull the house, furthermore that snow has weight and it is adding to the load on the ice. But let’s say you are out, the ice is pretty new…and it is thin. You think you are brave and want to fish “first ice” which is always the best ice fishing! What can you do to “stay safe”? Whether you are venturing out on “first ice” or later in the season with a full size pick-up, here are some tips that should increase your ability to survive fall through the ice. These are called “ice picks” and they are only around $6-$8 bucks a set. You will need a pair of these for every single person. They might save your life, I kid you not. you will need to wear them around your neck. They will float if you fall through the ice so you can get to them. They will NOT help you if they are stashed away in a compartment, or in the trunk…etc. Just a couple of weeks ago (this is written in Dec 2017), a couple of people decided to go out on the dangerously thin ice with an ATV for some “night fishing”(?) on the Upper Red Lake in Minnesota. They fell through the ice and drowned. Jake Seidenstricker said there were signs at the scene that the two struggled to get out of the water, breaking their fingernails and injuring their fingers. 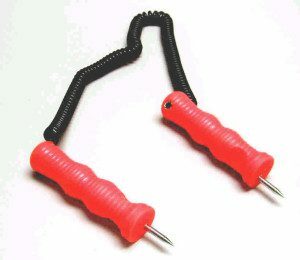 Just a SINGLE pair of these ice picks would have helped them and possibly could have saved their lives! When you break through the ice, you will NOT be able to open the doors! The water pressure combined with the ice right alongside your vehicle will prevent that from happening. Your only chance of escape is through the windows…and IF the electrical shorts out…you have a REALLY big problem! Keep the windows down! That way you can escape though the open window(s).